Stanford Advanced Materials can provide high quality Silver Trifluoroacetate (C2AgF3O2) with the most competitive price. 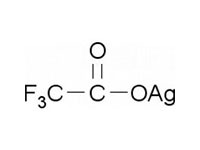 Silver Trifluoroacetate (C2AgF3O2) is light sensitive and hygroscopic. It is soluble in water, ether and benzene, and incompatible with strong oxidizing agents and strong bases. Storage condition: Keep the container tightly closed in a dry and well-ventilated place. 1g, 5g, 50g, 100g, 500g, 1000g in bottle or customized.